Last week, Karl Taro Greenfeld managed an unusual feat: he was allowed inside SeaWorld’s corporate offices to interview SeaWorld’s leadership and report a Businessweek story called “Saving SeaWorld,” about SeaWorld’s efforts to survive and bounce back from the surprisingly powerful and accelerating #BlackfishEffect (seriously, I think it is fair to say that no one involved with the production fully anticipated the impact that resulted). Since this is the first real access SeaWorld has given a big-time news organization since Blackfish started cratering SeaWorld’s image, its corporate relationships, and its stock price, it is worth taking a close look at what Greenfeld reported. I have to admit that I am sympathetic to SeaWorld on this point. SeaWorld had a long history of keeping its head down when bad things happen at its parks, and the bad news always blew away over time and allowed SeaWorld to get back to business. It is completely understandable that SeaWorld did not want to make a big deal out of Blackfish before Blackfish was, indeed, a big deal. Why help the public take notice of a film that will harm your business? And Atchison is correct, I think, that the CNN airings are what blew Blackfish up into a public phenomenon (an important lesson to all film-makers who want their work to have impact). Following Sundance, and through the film’s theatrical run, there was just not that much public awareness about Blackfish. I have never been in the loop on the theatrical numbers, but I don’t think Blackfish was packing the movie houses. It wasn’t until Blackfish hit cable television, on CNN in late October (along with a pretty good CNN-designed social media plan) that lots and lots of people saw Blackfish and started telling others about it. So throughout the Spring and the Summer, when people would tell me they were surprised SeaWorld wasn’t attacking Blackfish more vigorously, I understood where SeaWorld was coming from–they were following a playbook that had worked for them before. In fact, I was surprised when SeaWorld couldn’t quite manage to lay low, and fired off an easily de-bunked critique of Blackfish to film critics before the theatrical run, and also published a full page ad in a number of national newspapers. The result was a round of media stories that only helped the public become more aware of Blackfish, and helped Blackfish become the film “SeaWorld doesn’t want you to see,” exactly the result Atchison says SeaWorld was trying to avoid. Why did SeaWorld make the tactical mistake of sticking its head above the parapet and firing off the e-mail to film critics? I don’t know, but here is my theory. As Atchison noted, SeaWorld had hired a New York PR firm, 42 West, to help prepare for any Blackfish backlash. And expensive PR firms don’t usually pocket the check, and then advise: “Sit tight, don’t do anything at all right now.” So I imagined the pricey PR advisors in New York, who perhaps had the ear of SeaWorld’s corporate overlords at Blackstone, urging an aggressive PR response, while the savvy veterans down in Orlando who had been fighting this war against SeaWorld criticism for decades, like Fred Jacobs, were desperately counseling restraint. That is pure speculation on my part, and sadly Greenfeld’s reporting doesn’t offer any insight into the question of whether there was any division over PR strategy between SeaWorld’s in-house comms team and 42 West. And the simpler explanation might be that it was simply too hard for SeaWorld to sit still for that many months, while a film it deeply disagreed with was making the rounds. Either way, I don’t think sitting tight would have helped SeaWorld much, either. CNN had too much reach and the story Blackfish told was too shocking, and too at odds with the happy Shamu story SeaWorld had been telling for 45 years, for the public not to take notice. SeaWorld’s real PR bind, I have always believed, was not whether to attack Blackfish or not, or when to attack, but that the actual facts are not on SeaWorld’s side. That was was most clearly illustrated when a SeaWorld effort to convince the world that it doesn’t separate mothers and calves used a photo of a mother (Takara) and her calf (Kohana), who happen to be a mother-calf pair who were indeed separated (Kohana was shipped off to Loro Parque in the Canary islands when she was just 4 years old). D’oh. Greenfeld goes on to write about SeaWorld’s efforts to blunt Blackfish with its “SeaWorld Cares” theme. He writes that Atchison “adds that critics of SeaWorld fail to account for how toxic and dangerous the real world can be for orcas,” unfortunately without any analysis. Unfortunate, because killer whales are in fact doing pretty well in the wild, thriving in many oceans and even expanding their range into the Arctic as ice cover retreats. The idea that SeaWorld is a cushy, safe haven for killer whales who would otherwise be struggling in the toxic, dangerous oceans is ludicrous. The Southern Resident Killer Whales in the Pacific Northwest are indeed endangered, partly because they lost a generation to SeaWorld and other marine park captures, but mostly because the salmon populations they rely on for food are struggling. If “SeaWorld cares” it would have been worth asking Atchison what, if anything, SeaWorld contributes to the fight to boost salmon populations or protect the SRKW population. SeaWorld does 23,000 rescues, rehabilitations, and releases of animals every year, the largest number of any individual institution. The company estimates that it spends at least $7 million annually on rescue and release, and that does not include salaries of employees who spend part of their time on that program and other shared resources, such as medicine and food. At any given moment, there are manatees, pilot whales, dolphins, and sea turtles in the veterinary pools, being rehabbed and prepped for return to the wild. A tour of the park on a recent Thursday reveals a team of veterinarians in a surgical suite performing a biopsy on a Gentoo penguin whose air sacs weren’t properly inflating. –and that “rescued” marine mammals sometimes end up in SeaWorld’s shows. So it is not entirely an altruistic operation. (For interested readers, Whale and Dolphin Conservation have an excellent analysis of SeaWorld’s conservation funding work, also part of the “SeaWorld Cares” argument SeaWorld is making). Similarly, a serious perusal of SeaWorld’s research on killer whales–which Greenfeld mentions is also part of the “SeaWorld cares” strategy– would have revealed to Greenfeld that it is mostly research on how to better take care of, and breed, killer whales in captivity. Even the research he specifically cites–on how killer whales thrown together in captivity learn dialects from one another–is not really research that is very applicable or useful for wild killer whales, who tend not to fraternize much outside their group. SeaWorld hasn’t participated in capturing wild orcas since the practice was banned in 1972. Of the 29 whales it manages, five were captured—including Tilikum—and the rest were bred in captivity. To begin, while the Marine Mammal Protection Act was instituted in 1972, it did not ban the practice of capturing killer whales for “educational display.” SeaWorld, in fact, continued to capture killer whales in US waters after 1972 (Sandy, and Frankie, for example, were caught in 1973; and Kanduke was caught in 1975, though he first went to Marineland in Canada). The capture of killer whales in United States waters only stopped in 1976 when public outcry in the state of Washington over captures forced SeaWorld and other marine parks to move their capture operations to Iceland. Also, Greenfeld lets SeaWorld slide another one past him when he writes that only 5 of SeaWorld’s 29 killer whales were captured from the wild. The number is actually 6, with Morgan, the killer whale “rescued” in 2010 off the Netherlands, being claimed by SeaWorld after she was shipped to Loro Parque in the Canary Islands. Finally, SeaWorld was careful to stress it no longer captures wild killer whales. And that is true. But if SeaWorld’s PR campaign really wants to portray SeaWorld as having moved past wild captures, surely Greenfeld should have asked SeaWorld about its involvement in the capture of 18 wild Russian belugas, and the ongoing effort to get permission to import them into the United States. While I wish Greenfeld had been a bit more skeptical of SeaWorld’s spin, dug a little deeper into some of the issues raised, and pressed SeaWorld a bit, his reporting does reinforce one important fact about SeaWorld’s future: when it comes to killer whale entertainment, SeaWorld sees its future in Asia, Russia and the Middle East. Atchison says SeaWorld can sustain its killer whale population entirely from its breeding program. In fact, SeaWorld can breed enough whales to seed another park, but in the wake of Blackfish, Atchison is wary of opening another SeaWorld in the U.S. or Europe. Cultural sensitivity around marine mammals is different in, say, China, the Middle East, and Russia. And in September, SeaWorld announced a partnership with Australian media company Village Roadshow (VRL:AU) to develop parks in Asia and Russia. That means plenty of breeding, and new parks when possible abroad while investing in bigger habitats for the killer whales here in the US in an effort to stop the slide. Ultimately, if SeaWorld is successful enough franchising abroad it could end up with the option of moving its entire killer whale entertainment business abroad, which could act as a safety valve if the killer whale entertainment business here in the US continues to crater, or new laws restricting killer whale shows are passed. The question would then become whether anti-killer whale captivity sentiment will ultimately spread beyond Europe and the US, to the regions where SeaWorld tries to re-establish its killer whale revenue. That’s hard to predict, and so far there doesn’t seem to be a lot of public concern about killer whale and dolphin captivity in SeaWorld’s target markets. But you probably would have said the same thing about public sentiment here in the US 10 years ago. To me, this was the only real news in the Businessweek piece, the extent to which SeaWorld really is looking offshore. To finish, though, I have just a couple of notes. As I read this, I immediately thought: What about if the injury was to Nakai? Or Kandu, or any one of a number of SeaWorld killer whales who have sustained more than “superficial” injuries? Atchison estimates that 500 trainers have been employed at SeaWorld parks working with killer whales, making for a fatality rate of 1 in 500 over decades. With trainers no longer performing with killer whales, the risk has been largely eliminated, though Atchison, clearly, would like to get his people back in the water with the whales. Apparently Loro Parque trainer Alexis Martinez, for Atchison and SeaWorld, never existed. Yes, technically, he wasn’t on SeaWorld’s payroll. But he was trained by SeaWorld, killed by a SeaWorld killer whale under the supervision of a SeaWorld senior trainer, in a SeaWorld-managed killer whale program. I’d say that Atchison’s statistic should be revised to say 2 in 500, or 1 in 250 (and are there really 500 trainers who have worked at Shamu? Or is Atchison further cooking the numbers by including all SeaWorld trainers, even those who only worked with other marine mammals). Also, I would say that the death of Alexis Martinez, and the difficulty SeaWorld has had with Loro Parque and its standard of training, should be a caution to SeaWorld as it thinks about expanding abroad. Does SeaWorld plan to feature waterwork in any new parks it opens abroad? What will happen to SeaWorld’s brand if a trainer gets killed, as Martinez was, at a novice franchised park? Hmm, so you do not know, and cannot know, what the killer whales are thinking and feeling but you CAN assert they they live great and enriching lives. And any assertion to the contrary is just opinion. #LogicFail. 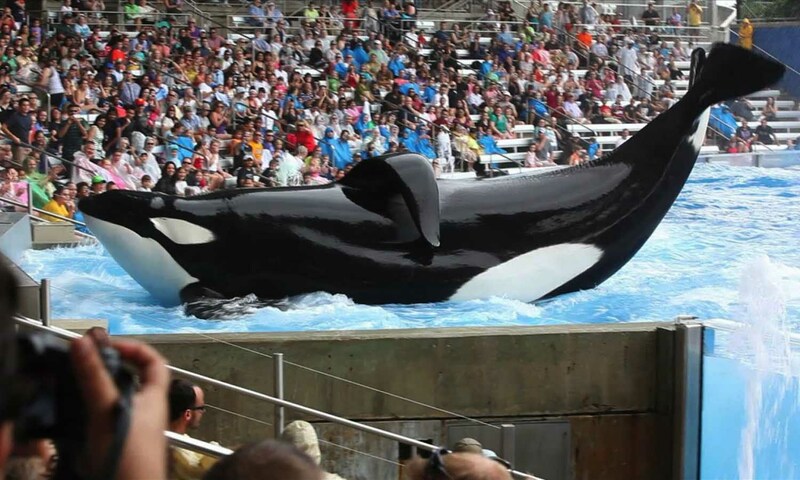 Finally, Greenfeld mentions former SeaWorld trainer John Hargrove, and his forthcoming book, Beneath the Surface: Killer Whales, SeaWorld, and the Truth Beyond Blackfish. In my humble opinion, that will be the next bombshell to blow up SeaWorld’s public image and earnings. Hargrove is passionate and has an encyclopedic knowledge of SeaWorld’s killer whales and the reality behind SeaWorld’s killer whale business. You may think that there is not much left to shock the public after Blackfish and all the scrutiny SeaWorld has received since its release. But Hargrove’s book will be shocking. And Atchison, Seaworld and 42 West will be faced once again with a PR problem that does not really have a solution. Kudos, Tim. This is an excellent comprehensive review and summary of the realities behind the spin in the Businessweek story. My only minor quibble is we shouldn’t use the word habitat to describe a display tank. That word is too important for describing the natural living spaces needed by all animals, including us, and shouldn’t be used, as SeaWorld always does, to describe what is really a cage. Nice of them to tell us so directly that they’re headed to Russia and China… the cesspools of human and animal rights. It means we need to direct our focus in the next 5-10 years to making sure these orcas and their offspring (which they seem to be “ramping up” production of) cannot be exported to these hellholes. Though it can’t be proven (and likely never could be) I’m sure they’re somehow behind the recent orca captures in Russia. A former stocker for Seaworld getting offered $7 million to come out of retirement and capture orca again? Someone knows somebody. It’s my understanding that SeaWorld is also assisting Russia in training it’s two new wild-caught Killer Whale. I’m sure they’ve written in some contractual agreement regarding breeding-stock exchange for the future. These people care nothing about the physical or mental well being of the animals in their care. It’s all about the $$. Awesome read. Looking forward to getting a copy of Beneath The Surface. One thing I noticed in the #logicfail paragraph; “they they” should read “that they”. Sorry, proof reading is a curse. Tim- Excellent story and point on. It made me sick to read Atchison continues to say “only one fatality” such incredible disrespect to Alexis Martinez that you first reported to the world as they did their best to cover it up. Shockingly they are still trying. Now as they boast of Kalia’s calf being born after artificially inseminating her at only 8 years old is repulsive. Until I see a DNA test on the calf, I don’t believe Ulises is the father. My entire career we collected sperm from Ulises and he never got a female pregnant naturally or via AI- now they expect us to believe his sperm is magically viable #notbuyingit. Thank you for the support for my book. I hope I’ve produced a book that can help and give people what they need and want to know- the shocking truth. I simply could not fit every story in the book and as you well know Tim you don’t have complete control when the publisher wants something removed or condensed but I can honestly say I’m pleased with the final product. There’s certainly enough in there to really piss people off (especially SeaWorld).